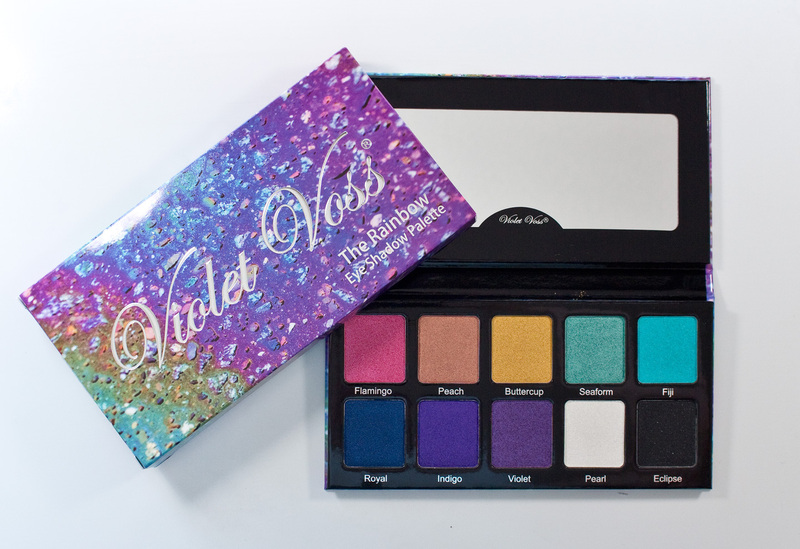 Violet Voss The Rainbow Eyeshadow Palette. The Violet Voss The Rainbow Eyeshadow Palette retails for $30US and $40CAN for 10 x 0.11oz / 3.2g eyeshadows. 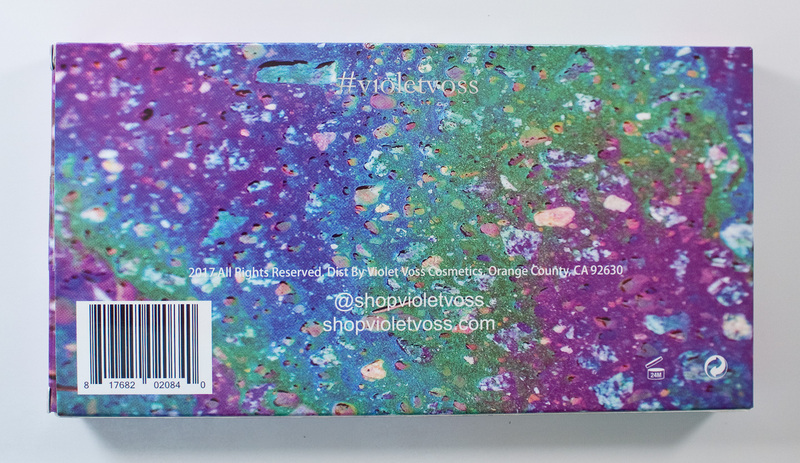 Violet Voss The Rainbow Eyeshadow Palette box back side. 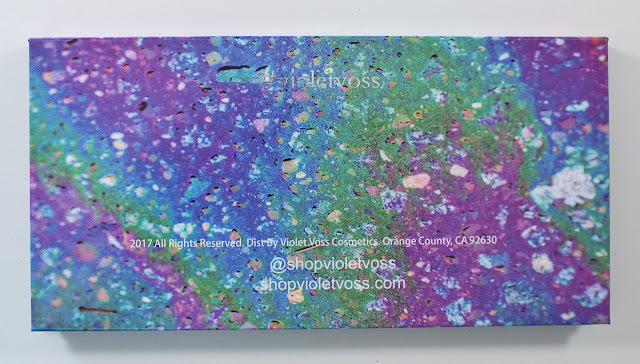 Violet Voss The Rainbow Eyeshadow Palette box side. 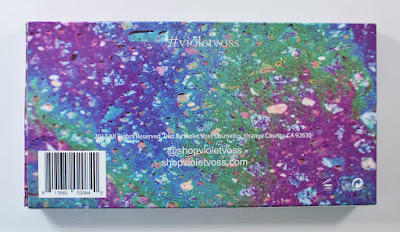 Violet Voss The Rainbow Eyeshadow Palette lid. Violet Voss The Rainbow Eyeshadow Palette bottom. 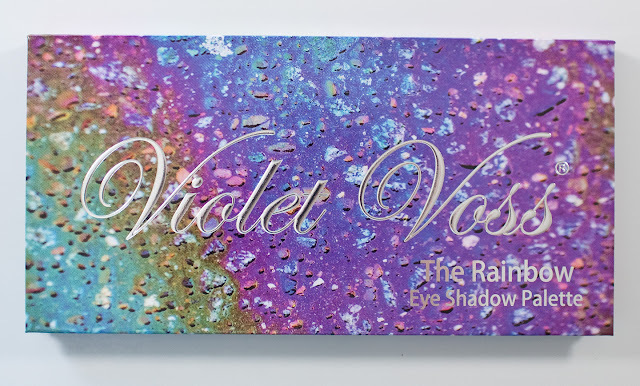 Violet Voss The Rainbow Eyeshadow Palette in Flamingo, Peach, Buttercup, Seaform, Figi, Royal, Indigo, Violet, Pearl, & Eclipse. Mica, Mineral Talc, Jojoba Oil, Kaolin Clay, Magnesium Stearate, Phenyl Trimethicone, Tridecyl Trime-llitate, Phenoxyethanol. 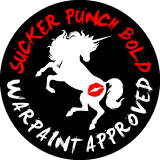 May contain (+/-): Mica and Titanium Dioxide (Ci 77891), Iron Oxides, Chromium Hydroxide Green (Ci 77288), Chromium-Oxide Greens (Ci 77288), Manganese Violet (Ci 77742), Ultramarines (Ci 77007), Ferric Ferrocyanide (Ci 77510), FD&C Red 40 Al Lake (Ci 16035), FD&C Yellow 5 Al Lake (Ci 19140), FD&C Blue 1 Al Lake (Ci 42090). The Metallic/shimmer shades do pack a punch regarding pigmentation, and the texture is buttery which allows you to sheer out nicely as needed but also intense enough to last on the skin without the need of a primer. The one Matte shade is still very pigmented black formula with micro shimmer that doesn't detract from the shade but it's not a soul-crushing black compared to some brand (but mostly other independent brands) but it gets the job done. Flamingo is a hot pink-red with a shimmer finish. Peach is a rust peach with a gold shimmer finish. Buttercup is a yellow gold with a shimmer finish. Seaform is a vibrant seafoam green with a shimmer finish. Figi is a vibrant aqua with a shimmer finish. Royal is a deep blue with a shimmer finish. Indigo is a blue-purple with a shimmer finish. Violet warm purple with a pink pearl shimmer finish. Pearl is an iridescent white with a pale gold/green aura finish. Eclipse is a matte black with a white micro-shimmer finish. Packaging: The palette is a cardboard laminated box with a mirror in the lid. The cardboard makes it easier to pry out the eyeshadows for depotting if you want to. Daylight swatches: Flamingo, Peach, Buttercup, Seaform, Figi, Royal, Indigo, Violet, Pearl, & Eclipse. Flash swatches: Flamingo, Peach, Buttercup, Seaform, Figi, Royal, Indigo, Violet, Pearl, & Eclipse. 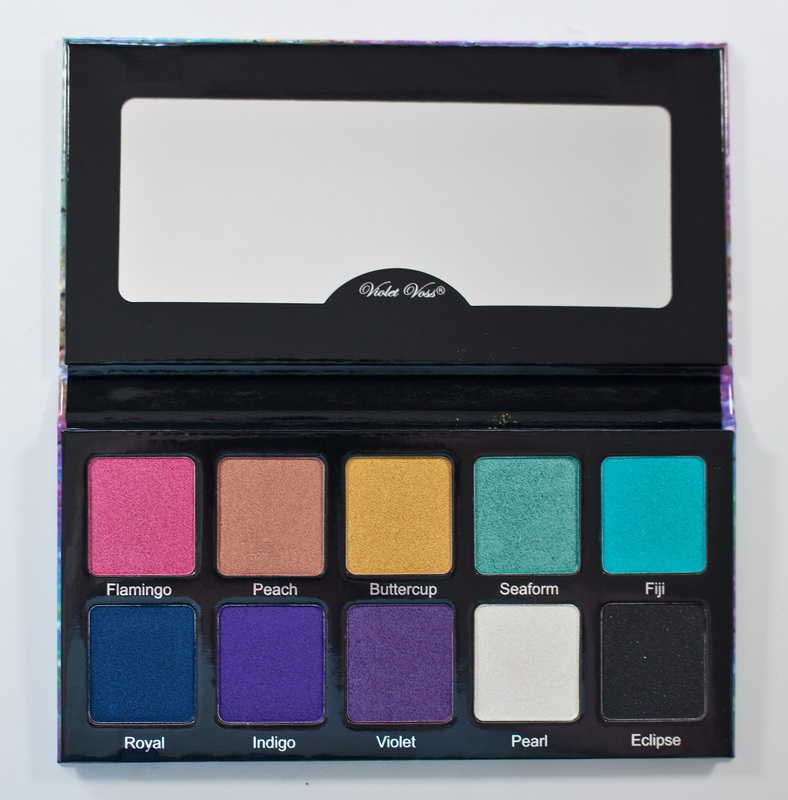 This is a perfect palette.... really! 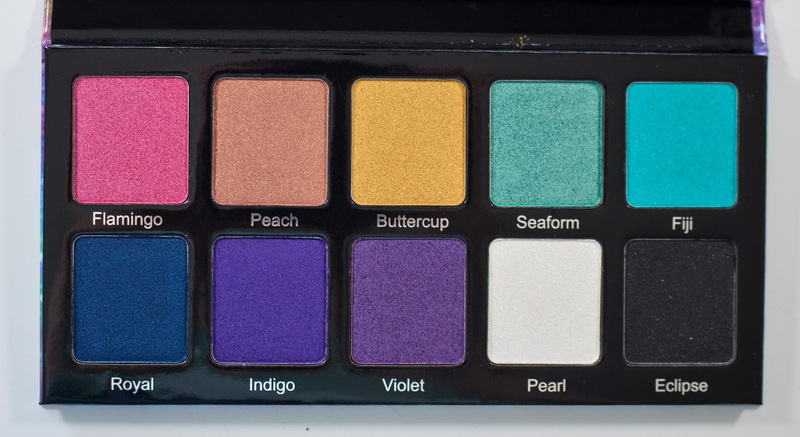 All the shades perform perfectly and that is partly due to being mostly shimmer shades but they are perfect. It's every shade you need to blend a rainbow of colours. At first, I felt like it was missing a true orange but mixing Buttercup to Peach get you a hot orange shade. One shade that is missing is a true red but realistically most people don't use Red eyeshadows as much as a pink. You can do almost of mixed of any custom shades with this palette so I'm recommending this one highly for people that light colour but may not need to have oft of rainbow shades in their collection.